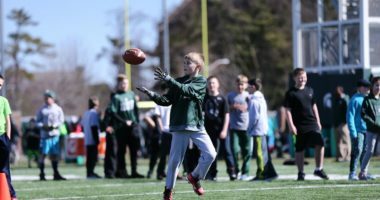 EAST LANSING, Mich. – The Michigan State football team opened spring practice with a two-and-a-half hour workout in helmets, jerseys and shorts on Thursday afternoon. The team split time indoors and outdoors, taking advantage of relatively warm temperatures in the mid-Michigan area, which reached the upper 50s, before rain showers forced the team back inside the Duffy Daugherty Football Building. 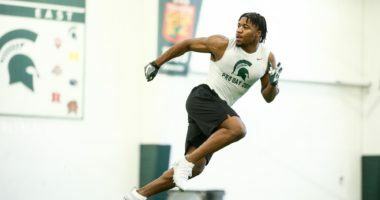 Michigan State has plenty of experience returning in 2019, as a total of 48 letterwinners and 17 position starters will be back for the Spartans. A total of 37 players returning have starting experience. On defense, the Spartans return 18 letterwinners and eight starters from a unit that finished ranked No. 1 in the FBS in rushing defense (77.9 ypg), No. 8 in scoring defense (17.2 ppg) and No. 10 in total defense (303.2 ypg). Out of a possible 143 starting positions last season over the course of 13 games, the Spartans are returning 105 of those starts (73 percent). Five of those eight returning starters started in all 13 games last season (LB Joe Bachie, S David Dowell, DT Mike Panasiuk, NTRaequan Williams, DE Kenny Willekes), while linebacker Tyriq Thompson started 12 games and defensive end Jacub Panasiukstarted 11 games. The Spartans will welcome nine starters back on offense, including two-year starting quarterback Brian Lewerke, leading rusher Connor Heyward and the top two receiving leaders in Darrell Stewart andCody White. MSU returns 100 percent of its passing yards from the quarterback position, 81 percent of its rushing yards and 76 percent of its receiving yards. Out of a possible 143 starting positions last season over the course of 13 games, the Spartans are returning 107 of those starts (75 percent). “I’m excited about 2019,” said Dantonio on Tuesday when talking with reporters. “Sometimes as I’ve said earlier, you find things by how you handle things when there are some downfalls or some problems. To me this is an opportunity to step back in. I’m excited about spring ball, I’m going to sort of immerse myself in terms of what we do on a day-to-day basis and look at everything and stay positive and stay current. MSU is scheduled to hit the practice field again on Saturday. The Green-White Spring Game, presented by McLaren Health Plan, is set for Saturday, April 13 at 2 p.m. in Spartan Stadium. 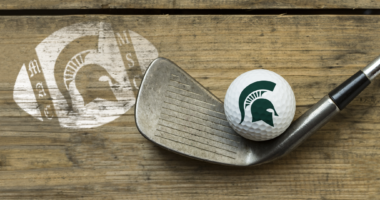 Donate today to show your support to former and future Spartans. Are You a Spartan Dawg? 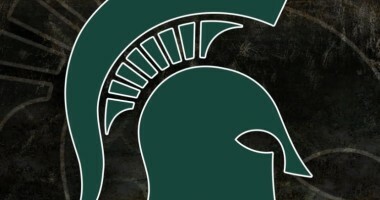 Join today to connect with fellow Spartan Football Alumni, support your fellow players and continue the traditions of the program.